In 2012 I conducted research, in parallel with my job at UCL, focusing on increasing student interaction and staff engagement of an in-class question and response system colloquially known as ‘clickers’. Evidence suggests clickers provide interaction opportunities to stimulate and engage learners and have a benign or positive effect in student performance. Clickers are popular across many disciplines, in particular the physical sciences, but there is a particularly low interest in medical sciences. I wanted to directly address this shortcoming so I enlisted two academics in the UCL Medical School. I assimilated the current method of teaching, and the materials used (K1). From here we adapted a learning activity to align with the new tool being applied (A1). I underpinned the use of the technology with existing literature and the evidence of realigning the ‘sage on the stage’ to the ‘guide on the side’ (K2), which evidence suggests is an effective method for learning and teaching (K3, V3). I provided pre-lecture technical support to reduce technical barriers and was on-hand in the lecture to support as/when needed (A2). Questions were designed into the lectures and the clickers provide immediate feedback (A3). Staff react to clicker data with an approach called ‘contingent teaching’ where they dynamically respond to the answers/feedback provided (A3). I designed evaluation questions for each lecture based on Bloom’s Taxonomy for learners-based evaluation of the teaching approach and learning outcomes (A4). Questions were derived from categorising Bloom into three sub-categories; remember or understand, apply or analyse the topic and evaluate or create new knowledge (K5). When questioned, 74% of students agreed or strongly agreed that the clickers and the related teaching approach encouraged interaction and helped to achieve metacognitive learning (K5). I integrated these data with post-lecture interviews for the lecturers. Using this analysis, we designed next steps for future use and identified gaps and areas for improvement (A5). I conducted evidence-based research and followed best practice around clickers to ensure inclusion was academically merited (V3). Measuring (and increasing) engagement within the traditional lecture was aiming to promote participation for learners (V2). It was understood that clickers do not directly enhance learning but can lead to higher-order learning. I used my understanding of the wider field of evidence to define their most appropriate use within the lectures (V1, V3). By implementing a technology which was new to staff and guiding them with appropriate techniques known to increase interaction and engagement, I provided an evidence-informed approach which could be used to transform didactic content delivery into something more engaging. My research adds to a disproportionately small body of knowledge for clickers in medical education and the study overall was positive. Staff involved still use the clickers, the impact I measured plus the evidence collected, can be further used to promote clickers within UCL, the Medical School and beyond. It earned me a Distinction in my MSc Learning Technologies and furthered my ambition to make a lasting, positive difference to higher education. King, A. (1993). From Sage on the Stage to Guide on the Side. College Teaching, Vol. 41, No. 1, p30- 35. Taylor & Francis Ltd.
 Beatty I. D., Gerace W. J., Leonard W. J. and Dufresne R. J., (2006). Designing effective questions for classroom response teaching, American Journal of Physics. Vol. 74, p31-39. Bloom B.S., (1956). Taxonomy of Educational Objectives, Handbook I: The Cognitive Domain. New York: David McKay Co Inc.
Jane Britton and Matt Whyndham recently piloted LectureTools with a small group of 17 students in a short course in project management. LectureTools is a cloud-based electronic voting system which students and their teachers can access via their laptops or mobile devices. 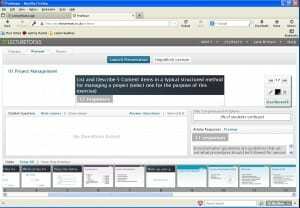 The system works by importing an existing PowerPoint presentation and then adding interactivity to it, through varied question formats. LectureTools allows students to take notes on their devices alongside each slide; they can also flag when they are confused about a particular slide, or submit questions, which will be displayed on the tutor ‘dashboard’ (see the screenshots below, click on each one to see a full size image). 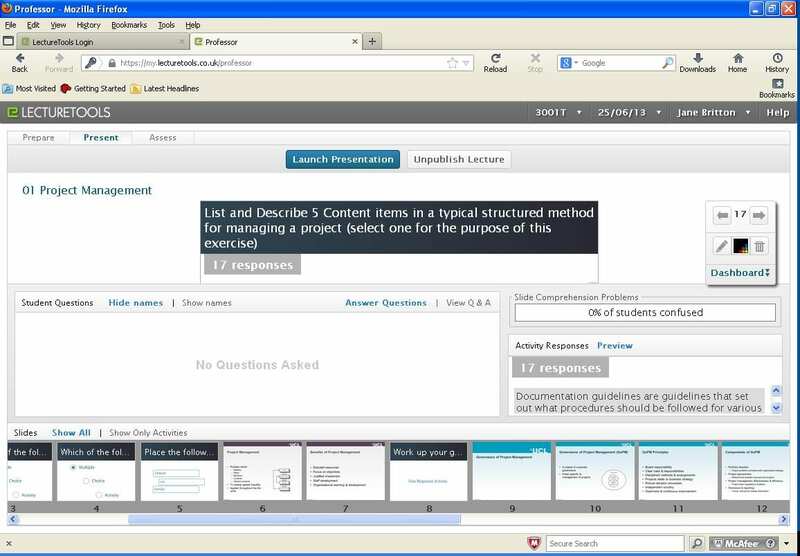 LectureTools presenter interface (the ‘dashboard’), showing an activity slide at the top, student responses and comprehension on the right, and a panel displaying student questions on the middle left. 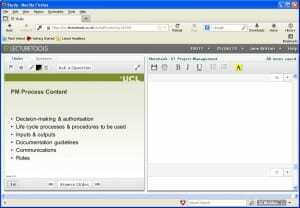 A preview of the adjacent slides is shown at the bottom of the screen. 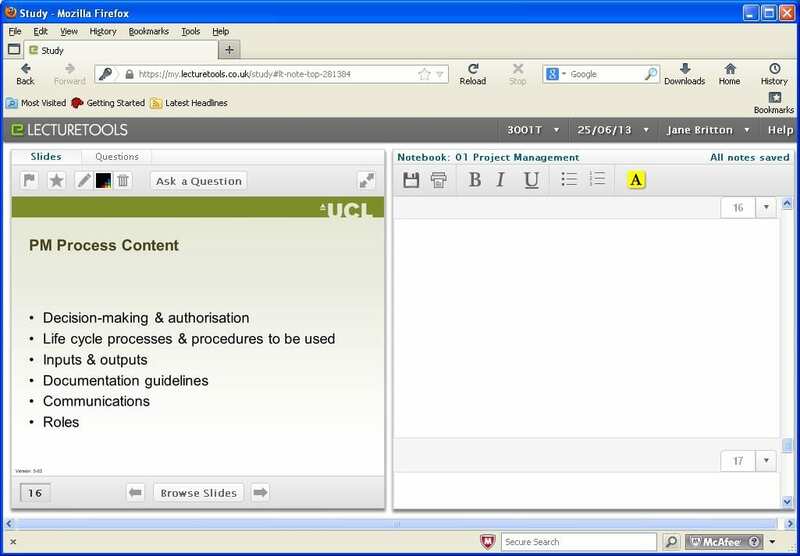 LectureTools student interface, showing the PowerPoint slides on the left with the interactive options above and the note-taking area on the right. Learning activities need to be carefully structured in order to give students enough time and opportunities to think about their topic, but not so much that they use the laptop to access resources not related to their studies. For this reason, the students and Jane and Matt considered that closed questions such as multiple choice questions might be better than open questions for large lectures. A working paper of this study will shortly be uploaded to UCL Discovery. E-Learning Environments is working with other staff in various departments around the university to explore the potential of LectureTools to facilitate interactive lectures. If you would like more information or would like to pilot LectureTools or a comparable electronic voting system, please contact myself or Janina Dewitz, our Innovations Officer. As part of UCL’s involvement in the Cheltenham Science Festival, someone from our team goes down to Cheltenham to support the use of electronic voting in some of the events there. My colleague Matt has already blogged about the kinds of things we do. This year, one of the groups we are supporting is the Festival of the Spoken Nerd – Helen, Matt and Steve – who are doing a show in Cheltenham on Thursday 14 June. Last night they did a try out of some of their material in the upstairs room at the Green Man in London. They certainly had a packed house, although seating only about 30 at a squeeze the venue is very cosy and the audience certainly get to interact with the performers. Part of the performance was a re-make of Bruce Forsyth’s Generation Game, with a teams loosely led by each of the performers and a series of science and maths questions to answer. The voting handsets led each member of the audience have their say, with a number of trick questions to add to the fun. So far, so fairly ordinary in the world of voting. But what made it more interesting was another part of the performance where teams used their mobiles to play pong against each other using crowd-sourcing to aggregate the individual commands to move the bat up or down. We started talking about how the voting handsets might be used within this. TurningPoint do provide an SDK, and with this it should be possible to use the handsets as controllers for pretty much any application. It turns out that a colleague, Daniel Richardson, has already done this, using voting handsets to control a crowd tightrope walking game. So, what else could we do with the handsets. Well, lots. For Economics, how about a simulation where different teams play the Treasury, Bank of England, Banks etc in a simulation of the economy. Controlling machinery in Engineering. Determining the functioning of the human body in medicine. We could take it further. Rather than having each handset being an equal partner in the crowd-sourcing efforts, we could plant catalysts or decoys to simulate real world phsychology or group behaviour, or disease or system failure. There is lots of potential here to go beyond simple multiple choice questions to involve the audience in dymamic live simulations, games and experiments. I’m quickly discovering that there’s much more to these simple handsets than I ever realised. Provost announces this year’s teaching awards – using learning technology? This week the Provost has requested nominations for this year’s teaching awards to ‘recognise those who make an outstanding contribution to teaching at UCL.’ This year there will be ten awards handed out and the winners receive some well-deserved respect for the hard work they put in. The deadline for nominations is 15th March. But how does this relate to Learning Technology? Well, in addition to the innovative thinking, hard work, extra time, dedication and commitment to excellent teaching at UCL many of the winners from the past years have been leading the way forward by incorporating e-learning or learning technology into the heart of education. Past winners have made particularly good use of technologies such as Moodle or Electronic Voting Handsets and embedded them right into the curriculum. The Learning Technology Support Service would always welcome anyone from the UCL community to get in touch with us and see how we can work together to try new things, or perhaps even try old things which we know work well – but still might be new to you!